While I still have a few books in the queue mainly focused around TPS, I started reading Maverick: The Success Story Behind the World’s Most Unusual Workplace, the prequel to The Seven-Day Weekend: Changing the Way Work Works. Not too far into it yet, but riveted again. Pretty amazing story. Highly recommend both books. I’m really curious about a lot of the ideas in these books, and how they would work in a traditional company. I know I’ve made little adjustments in this direction even before reading the books, but now I’m really curious as to how extreme you can go. Ricardo seems to have had great success going more extreme than most. I admire his idealism and his trust in people. 2. Small things can become big. 3. Don’t go too wide. 5. Don’t do anything you aren’t absolutely passionate about. The other night the ignition switch on the furnace went out in the house. I watched as Jonna spent a ton of time searching for the contact information for the guy who came out the last time we had a problem. It took quite a while to find the information, but finally she found it. When she got a hold of him, he started asking questions about a blinking light on the furnace. We had no idea what he was talking about, but I did remember he gave us information last time he was here – I just couldn’t remember what it was. Yesterday as I was driving to work, I was reflecting on the activities of the night before. Why did we not have this information available when we needed it? Where could we put it so that if something happened again, we could have it readily available? How can we take these kinds of notes effortlessly and ensure that we know where we put them? Then a stark realization hit me. We’ve already solved this problem – at work. In early 2004, at the urging of one of my direct reports, we installed wiki software at the office to solve just this problem. All of our information was scattered around network drives, none of it really searchable. Doug was very into Python at the time so we chose ZWiki, a wiki package that runs on the Zope application server. We used that for about 1 1/2 years until we finally bit the bullet and moved to MediaWiki, where our information repository lives today. We actually have quite a knowledge base going there now, everything from detailed process information, to configuration information, to even some projects that are being managed on the platform, with detailed information about all of the issues encountered, configuration information, and the like. It has become a one stop shop for all information related to our environment. And I’ve been the primary champion since it was installed. This was when, as I was sitting in the car pondering this, that the title of this post came to me. The old adage is true. There are so many problems that we solve in our daily business lives that never get resolved in our personal lives, and vice versa. Its amazing to me that while we’ve done so much at work to centralize the information in our department (while decentralizing the authoring so that if something is found to be wrong it can be corrected) that I never thought to apply this at home to keep all of our information straight here. Instead, Jonna spends countless amounts of time searching through kitchen drawers for information on service providers and I sit trying to remember that one valuable piece of information that the furnace guy absolutely needs so that he can arrive and fix the part, rather than wasting trips to and from our house to first diagnose the problem, then go get the parts to fix it. 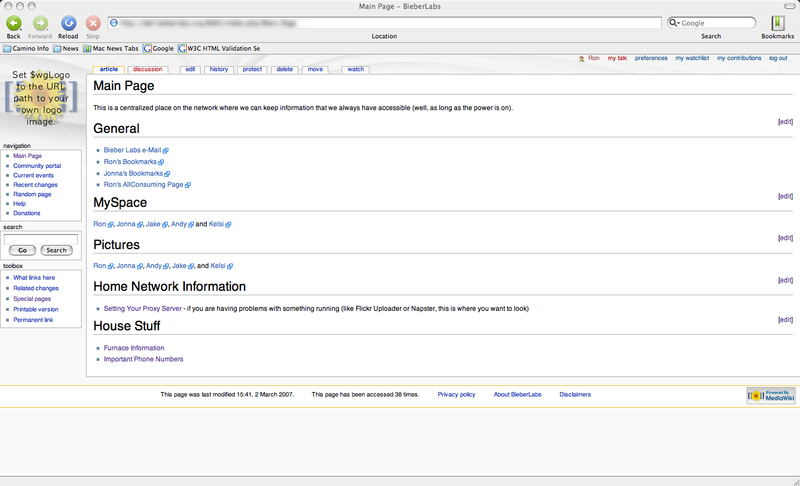 So, I’ve spent this morning getting MediaWiki running here at the Labs. Hopefully, I can motivate the family to use it as we have motivated our employees to use it at work to keep all of our important information centralized and updated. Its a simple thing to set up, but can be rather difficult to socialize. Luckily, we only have 5 people here, so the socialization might be a tad bit easier to do. How many things do you struggle with at home that have been solved for years at work? Maybe you even had a hand in solving them, but the solution never seeped into your life outside of work? This was a major “AHA” moment for me this week and I’d love to hear about other people who might have similar stories. Now I’ve Heard It All: Management Lessons from RoadHouse! One of my favorite “bad” movies that I just cannot switch past when its on is the movie “Road House“. As a matter of fact, we went out and bought the DVD so that when it is on TV, I can pop in the DVD and watch the “unedited” TV version of the movie – thats how addictive the movie is to me for some reason. I just cannot “not” watch it when its on. 1. Never underestimate your opponent. Expect the unexpected. 2. Take it outside. Never start anything in the bar unless its absolutely necessary. If someone gets in your face and calls you a <bleep>, I want you to be nice. DALTON: Ask him to walk, but be nice. If he won’t walk – walk him – but be nice. If you can’t walk him, one of the others will help you – and you’ll both be nice. I want you to remember that its a job. Its nothing personal. EMPLOYEE 2: Uh, huh. Being called a <bleep> isn’t personal? DALTON: No. Its two nouns combined to elicit a prescribed response. EMPLOYEE 2: [laughs] Well what if someone calls my mama a whore? DALTON: Is she? [pause with employee laughter] I want you to be nice until its time to not be nice. EMPLOYEE 3: Well, uh, how are we supposed to know when that is? DALTON: You won’t. I’ll let you know. You are the bouncers, I am the cooler. All you have to do is watch my back – and each others … and take out the trash. I guess it just goes to show you that there are leadership lessons everywhere, you just have to be looking for them. Road House, honestly, would have been the last place I would have looked, but damned if they aren’t there as well. As an aside, I’ve just started reading a book called Leadership Sopranos Style: How to Become a More Effective Boss. Again, another place I would not necessarily look for leadership lessons. The book is pretty good so far. I’ll probably write something up on it when I finish it. I like books and lectures that use pop culture to make the concepts more accessible. We need more of this in the world, rather than the dry theory of most leadership related material.